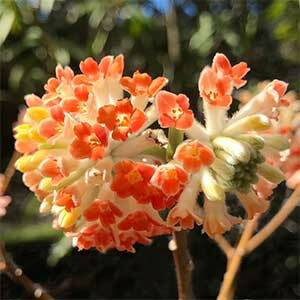 Related to the daphne and with fragrant flowers Edgeworthia chrysantha is commonly called the Paper Bush. The flowers form as terminal clusters, and this deciduous shrub flowers in late winter to spring. The species itself has golden yellow flowers, Edgeworthia chrysantha ‘Red Dragon’ has red to Orange flowers and both have the same growth habit. Edgeworthia chrysantha is originally from the Himalayas, China and Japan where the bark is used to make a type of handmade paper. These are a plant that do require a little protection from very hot winds and cold winds. A sunny proceeded position works well. Dig the soil over well before planting, removing weeds and adding some compost. Provide moisture through dry summer periods as required. From seed, or from cuttings taken in summer. Flowers – Yellow, or Red to Orange.